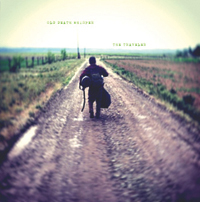 Old Death Whisper released its first full-length album, “The Traveler,” in 2013. It’s like listening to the Sons of the Pioneers on steroids, with a touch of Bob Dylan thrown in and a bluegrass sound reminiscent of Doc Watson. One could describe the music of Old Death Whisper, a local favorite once known as the Damphools, as country rock ’n’ roll. But it’s much more than that. Old Death Whisper can slip briefly into Hendrix guitar chaos, or strike an occasional weird Coldplay-type chord, or sing down and dirty like Tom Petty and the Heartbreakers. Somehow, it all seems to fit together, and one way or another, its darn good music. Many people are familiar with the band, since Old Death Whisper has appeared frequently over the past several years at local bars, at local events and at fundraisers. Anyone who hasn’t heard Old Death Whisper can catch them on YouTube, or at the band’s website at olddeathwhisper.com, where a half-dozen songs are available for listening. But better yet would be a live performance. Come Sept. 5, Old Death Whisper is scheduled to play at the Silver Dollar Saloon in Bellevue. The day after that, the band will play at a music festival it organized itself at East Magic, in southern Blaine County. Old Death Whisper reports in a news release that the Occupy East Magic festival, scheduled for Sept. 6, builds off of a somewhat humble festival the band organized two years ago at Hill City on the Camas Prairie. This year’s festival is on a much larger scale, with more than a dozen local and regional bands lined up for the event. Playing from the Wood River Valley are the Hurdy Gurdy Girls, the Lower Broadford Boys, South of Bellevue, the Sheep Bridge Jumpers, Up a Creek, and of course, Old Death Whisper. Boise bands appearing are Poke, Jonathon Warren & the Billy Goats, George Devore & the Devil Makes 4 and Hillfolk Noir. Ugly Valley Boys are lined up from Salt Lake City and Tylor Bushman from Helix, Ore. Nonetheless, Occupy East Magic is described by the band as “family friendly event.” Camping and food will be available. There’s room for RVs, but no hookups. Festival attendance is cheap. Old Death Whisper is asking for a $20 donation per person to pay the musicians for their time and travel. Old Death Whisper organized Occupy East Magic amidst a busy schedule, indicative that the band has not forgotten its Wood River Valley roots. The group recently toured the U.S. and Europe, but continues to play locally and regionally. In addition to Old Death Whisper, playing on Friday, Sept. 5, the Silver Dollar Saloon in Bellevue has other top-notch acts lined up for the next month. Throttle Back plays on Aug. 15, South of Bellevue on Aug. 22, and Nothing but Heroes on Aug. 29. Saturday, Aug. 30, has a special show with George Devore & the Devil Makes 4. On Sunday, Aug. 31, DJ Marlin will be performing.